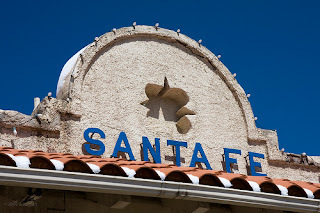 The Frugal Burqueño: Win a getaway to Santa Fe! Win a getaway to Santa Fe! Today I received the July issue of New Mexico Market Place with a very nice sweepstakes. If you find twelve American Flags hidden in ads you can win a fabulous getaway for two to Santa Fe. Prize package includes one free night's stay at the luxurious Bishop's Lodge Ranch Resort & Spa, plus half off the second night; $50 certificate towards lunch or dinner; $25 discount off one spa service ; $25 discount off horseback rides. You can mail the entry form or register online. Entries must be received by July 20, 2011. Have you ever won a prize from a local newspaper?